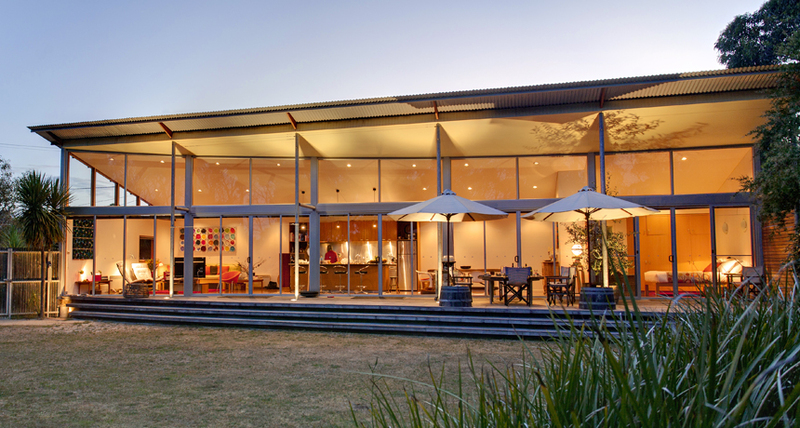 Arthouse Bay of Fires is a stunning beach house on the north east coast of Tasmania. Secluded amongst bushland, the two bedroom self contained property has gorgeous garden views and ocean glimpses through the open plan layout. With stunning original artworks and bespoke furniture from the family of artists that co-own and run the property, you will enjoy this stylish and private home. Arthouse Bay of Fires is a luxurious secluded two bedroom self-contained property that has everything you need to relax, swim, fish, do yoga, take bushwalks and take in the stunning north east coast of Tasmania however you see fit. Make sure your camera battery is charged, the Bay of Fires has remarkable natural beauty, intense colours and stunning light. With one minute walk to the private northern end of Binalong Bay beach and direct access to bushwalking track, you will be able to witness the natural beauty. Perfect for a couple wanting to spend time away from it all, you have all the comforts provided for you, including an array of interesting reads, films and tunes to get lost in. The Bay of Fires is a region on the north east coast of Tasmania in Australia, extending from Binalong Bay to Eddystone Point. It's a 2 hour drive from Launceston Airport via North Midland Hwy via Fingal Valley & St Mary’s. It's a 3 hour drive from Hobart Airport via east coast (Swansea & Bicheno) or Midlands Hwy via Lake Leake or Fingal Valley & St Mary’s. Cancellations or postponements made within 7 days of booking arrival date will incur a 100% cancellation fee. Cancellations made with more than 7 days notice incur an administration charge of 35% of the total booking fee. A credit voucher can be arranged if rebooked within 6 months of original booking and deduct an administration fee. We encourage our customers to take out travel insurance to cover any unforeseen circumstances. A $500 bond is payable directly to the owner prior to arrival. Arthouse is a self-contained beach house offering two bedrooms with queen-sized beds that adjoin a bathroom complete with bath and two hand basins. The expansive, stylish, light open plan living space lead onto a large north facing deck and overlook the secluded garden with sounds of the ocean and water glimpses. Please note: This property requires a $500 bond, which will be organised directly with property owners prior to arrival. Arthouse is a self-contained beach house offering two bedrooms with queen-sized beds that adjoin a bathroom complete with bath and two hand basins. The expansive, stylish, light open plan living space lead onto a large north facing deck and overlook the secluded garden with sounds of the ocean and water glimpses. Please note: This property requires a $500 bond, which will be organised directly with property owners prior to arrival.